The most important issues in the law of robotics require us to understand how human beings exercise power over other human beings mediated through new technologies. The “three laws of robotics” for our Algorithmic Society, in other words, should be laws directed at human beings and human organizations, not at robots themselves. Third, the central public duty of those who use robots, algorithms and artificial intelligence agents is not to be algorithmic nuisances. Businesses and organizations may not leverage asymmetries of information, monitoring capacity, and computational power to externalize the costs of their activities onto the general public. The term “algorithmic nuisance” captures the idea that the best analogy for the harms of algorithmic decision making is not intentional discrimination but socially unjustified “pollution” – that is, using computational power to make others pay for the costs of one’s activities. Obligations of transparency, due process and accountability flow from these three substantive requirements. Transparency – and its cousins, accountability and due process – apply in different ways with respect to all three principles. Transparency and/or accountability may be an obligation of fiduciary relations, they may follow from public duties, and they may be a prophylactic measure designed to prevent unjustified externalization of harms or in order to provide a remedy for harm. Although 2016 was a breakthrough year for artificial intelligence (AI) in legal services in terms of market awareness and significant take-up, legal AI represents evolution rather than revolution. Since the first ‘robot lawyers’ started receiving mainstream press coverage, many law firms, other legal service providers and law colleges are being asked what they are doing about AI. Robots in Law: How Artificial Intelligence is Transforming Legal Services is designed to provide a starting point in the form of an independent primer for anyone looking to get up to speed on AI in legal services. The book is organized into four distinct sections: Part I: Legal AI – Beyond the hype Part II: Putting AI to work Part III: AI giving back – Return on investment Part IV: Looking ahead The first three present an in-depth overview, and analysis, of the current legal AI landscape; the final section includes contributions from AI experts with connections to the legal space, on the prospects for legal AI in the short-term future. Along with the emergence of New Law and the burgeoning lawtech start-up economy, AI is part of a new dynamic in legal technology and it is here to stay. The question now is whether AI will find its place as a facilitator of legal services delivery, or whether it will initiate a shift in the value chain that will transform the legal business model. Hoping to represent a class of consumers who bought LN’s New York Landload-Tennat Law (aka the Tanbook), the law firm of Himmelstein, McConnell, Gribben, Donoghue & Joseph brought a Feb. 23 complaint against the publisher in Manhattan Supreme Court. “Rather than an authoritative source of state statutes, laws and regulations, the Tanbook, which is represented by the defendant as complete and unedited, is instead, at least as pertains to those involving rent regulated housing in New York rife with omissions and inaccuracies, rendering it of no value to the attorneys, lay people, or judges who use it,” the 25-page complaint states. In The Best Apps To Track Trump’s Legal Changes, Bob Ambrogi identifies three apps designed to monitor the Trump administration’s actions. Columbia Law School’s Trump Human Rights Tracker follows the Trump administration’s actions and their implications for human rights. How likely is algorithmic transparency? Given the importance of search engines for public access to knowledge and questions over their neutrality, there have been many theoretical debates about the regulation of the search market and the transparency of search algorithms. However, there is little research on how such debates have played out empirically in the policy sphere. This paper aims to map how key actors in Europe and North America have positioned themselves in regard to transparency of search engine algorithms and the underlying political and economic ideas and interests that explain these positions. It also discusses the strategies actors have used to advocate for their positions and the likely impact of their efforts for or against greater transparency on the regulation of search engines. Using a range of qualitative research methods, including analysis of textual material and elite interviews with a wide range of stakeholders, this paper concludes that while discussions around algorithmic transparency will likely appear in future policy proposals, it is highly unlikely that search engines will ever be legally required to share their algorithms due to a confluence of interests shared by Google and its competitors. It ends with recommendations for how algorithmic transparency could be enhanced through qualified transparency, consumer choice, and education. Berkeley J. Dietvorst, The University of Chicago Booth School of Business, Joseph P. Simmons, University of Pennsylvania, The Wharton School, and Cade Massey, University of Pennsylvania, The Wharton School, Algorithm Aversion: People Erroneously Avoid Algorithms after Seeing Them Err, Journal of Experimental Psychology: General (forthcoming). 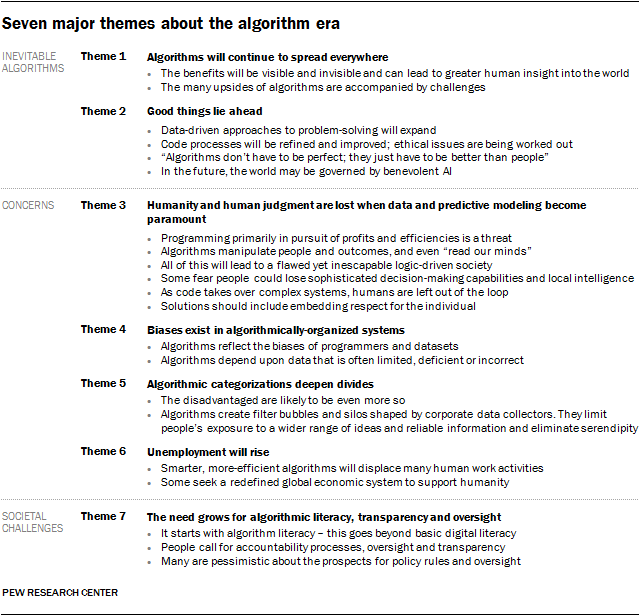 Abstract: Research shows that evidence-based algorithms more accurately predict the future than do human forecasters. Yet, when forecasters are deciding whether to use a human forecaster or a statistical algorithm, they often choose the human forecaster. This phenomenon, which we call algorithm aversion, is costly, and it is important to understand its causes. We show that people are especially averse to algorithmic forecasters after seeing them perform, even when they see them outperform a human forecaster. This is because people more quickly lose confidence in algorithmic than human forecasters after seeing them make the same mistake. In five studies, participants either saw an algorithm make forecasts, a human make forecasts, both, or neither. They then decided whether to tie their incentives to the future predictions of the algorithm or the human. Participants who saw the algorithm perform were less confident in it, and less likely to choose it over an inferior human forecaster. This was true even among those who saw the algorithm outperform the human. ► An executive order on ethical standards for administration appointees, as it appears on the White House website, refers to”section 207 of title 28″ of the U.S. Code. As the nonprofit news site Pro Publica reported last week, that section does not exist. The Federal Register correctly cited section 207 of title 18, which does exist. Abstract: When legal researchers search in online databases for the information they need to solve a legal problem, they need to remember that the algorithms that are returning results to them were designed by humans. The world of legal research is a human-constructed world, and the biases and assumptions the teams of humans that construct the online world bring to the task are imported into the systems we use for research. This article takes a look at what happens when six different teams of humans set out to solve the same problem: how to return results relevant to a searcher’s query in a case database. When comparing the top ten results for the same search entered into the same jurisdictional case database in Casetext, Fastcase, Google Scholar, Lexis Advance, Ravel, and Westlaw, the results are a remarkable testament to the variability of human problem solving. There is hardly any overlap in the cases that appear in the top ten results returned by each database. An average of forty percent of the cases were unique to one database, and only about 7% of the cases were returned in search results in all six databases. It is fair to say that each different set of engineers brought very different biases and assumptions to the creation of each search algorithm. One of the most surprising results was the clustering among the databases in terms of the percentage of relevant results. The oldest database providers, Westlaw and Lexis, had the highest percentages of relevant results, at 67% and 57%, respectively. The newer legal database providers, Fastcase, Google Scholar, Casetext, and Ravel, were also clustered together at a lower relevance rate, returning approximately 40% relevant results. Whether the physical space of a public library is entitled to some degree of special protection under First Amendment jurisprudence is of great import to public library administrators for a variety of reasons that include the development of patron behavior policies, patron interaction and staff training, and reducing the probability of litigation involving the infringement of First Amendment rights of patrons. This paper discusses the legal intersection of First Amendment protections and public library spaces and suggests constructive steps public libraries may take to reduce risks of litigation, legal costs, and exposure to First Amendment hazards with patrons.